Two weeks after Cyclone Phailin struck Odisha (formerly Orissa) and Andhra Pradesh at 140 mph, the Eastern Indian states are still reeling. According to aljazeera.com, just forty-five people have been reported dead in Odisha, but more than half of the state’s population of 42 million has been affected by the cyclone and resulting floods. 800,000 houses and over 860,000 hectares of farmland have been damaged, while 210,000 electrical poles and over two and a half million trees have been uprooted. 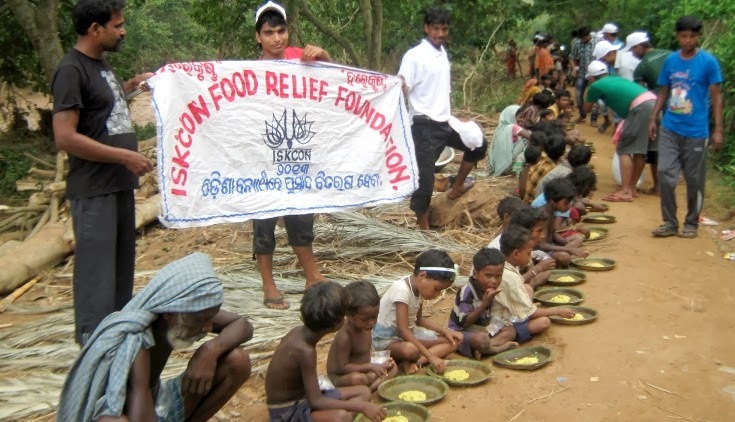 Doing its part to help, ISKCON Food Relief Foundation — which delivers healthy vegetarian meals to 1.2 million underprivileged school children around India every day — flew members into Odisha on October 15th. 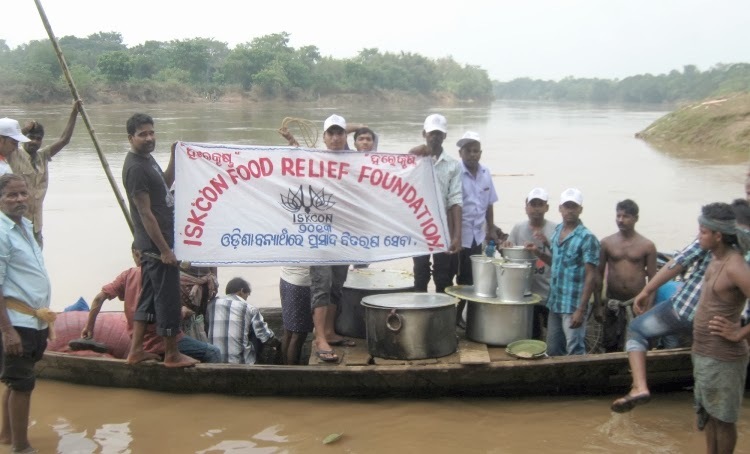 A volunteer crew of fifty devotees has been cooking kichari at the small ISKCON center in Remuna for the past two weeks, and delivering it along with drinking water to affected villages in Odisha’s Balasore District. During their first round of relief work, from October 15th to 21st, devotees have fed 27,500 people in thirty villages. Many of these villages had been completely flooded by the Suvarna Rekha river for three days straight, leaving residents unable to get food for their survival. Villagers, forced to take shelter on the roofs of their inundated homes, were starving. Some had not eaten any food at all for two days. Others were left huddling in the streets, as their homes had been completely destroyed. To reach the villages, IRF volunteers often had to transport prasad across rivers and trudge through deep mud. “It was very adventurous and exciting,” Achyutananda says. At the end of the first phase of the food relief operation, a special thanks giving ceremony was held for the volunteers. Now, Achyutananda says he is starting a second round of food relief work in the badly affected Ganjam District of Odisha.